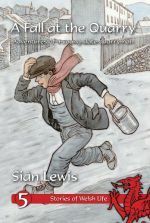 A book in a series that looks at different periods/backgrounds in Welsh history, on which the story is based; this story is about the adventures of a quarryman. Suitable for readers aged 9-11 years. This attractive book is one of a series providing glimpses of early Welsh life through the eyes of children. We are introduced to thirteen-year-old Jack Edwards who is recovering from an accident. We are kept in suspense about the nature of the incident as we listen to Jack recounting his experiences as a ‘rubbler’ at his local slate quarry in north Wales. We soon learn of the poor pay, the harsh conditions on the mountain, the strict rules, the gulf between the owners and the workmen, and the constant extreme dangers of the quarrying industry. However, lively distractions are mentioned, such as the varied cultural activities in the lunchtime ‘cabans’ and the dare-devil adventures riding the wild-cars down the tracks. We eventually discover the pun on the word ‘fall’ in the title and the way in which Jack emerges as a hero! The narrative is as fast-paced as any wild-car, and the illustrations are vivid and evocative showing us both the home and the working environments of the brave quarrymen of the 19th century. What an entertaining way of learning about our rich heritage!